WOKING is an example to the rest of the country of interfaith understanding and the integration of Islam in the community, the Minister for Faith has said. Lord Bourne of Aberystwyth was speaking during a tour of the Shah Jahan Mosque three days after 50 people were shot dead at two mosques in Christchurch, New Zealand. The visit had been planned months before the tragedy and is part of a tour by the minister to places of worship around the country to promote interfaith understanding. 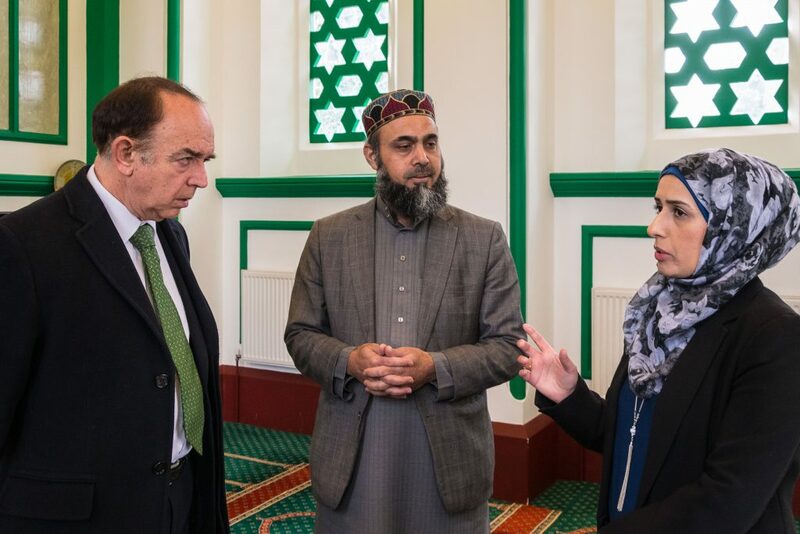 He was shown around the first purpose-built mosque in Britain by Hafiz Hashmi, the Head Iman, and his wife Kauser Akhtar, who is chairwoman of the South East England Faiths Forum and faith links adviser for Surrey Faith Links, run by the Diocese of Guildford. Lord Bourne said the strong interfaith links in Woking “is where we want everybody to be”, paying tribute to the leadership of the Imam and Kauser, describing it as “very powerful in the world in which we are living”. They told the minister about the mosque’s involvement in the community, from the annual Armistice Day parade in Woking Town Centre and helping the homeless, as well as working with people of all faiths and hosting regular visits from schools. They also explained that, along with formal open days at the mosque, it is open for anyone to visit and the Imam is available to answer questions about Islam. A prayer and peace vigil for the victims and families of the New Zealand shootings is being held at the Shah Jahan Mosque on Saturday 23 March, starting at 2pm. All members of the community are invited to attend, to show solidarity and unity against such terror attacks.